Offering you a complete choice of products which include bag stacker and loading conveyor. Our organization is the topmost provider of Bag Stacker to our clients. These products are manufactured using innovative technology and are considered suitable for conveying tasks or applications. Bag Stacker is used for loading and unloading in various places. The offered range is checked on various parameters to provide a flawless range to the clients. Further, these are suitable for handling of products like sugar, grain, and others. We are the leading manufacturer and supplier of Bag Stacker in Tamilnadu, Kerala, Coimbatore, Tirupur, Karur, Salem, Chennai etc. 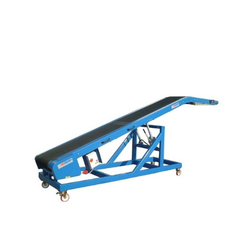 We are one of the leading manufacturer and supplier of Loading Conveyor Or Bag Stacker.We obligate to meet the quality standards, as per the customer request.